Assassins Creed Origins (Playstation 4) Brand NEW !! 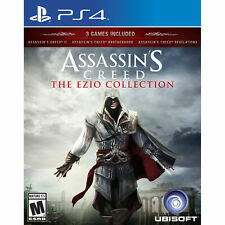 Assassin's Creed: The Ezio Collection. Explore deeper into Ezio's incredible saga with two bonus short films that go beyond the trilogy. Assassin's Creed II. Assassin's Creed Brotherhood. Assassin's Creed Revelations. Assassin's Creed Odyssey for Xbox One 2018. Condition is Used, good condition. No scratches or smudges that I can see. Smoke free home. PayPal only. Shipped with USPS First Class Package. Please let me know if you have any questions. Just like new. Played it once. Assassin's Creed: Origins (Sony PlayStation 4, PS4, 2017) Free Shipping. Condition is Very Good. Shipped with USPS First Class Package. Assassin's Creed: Origins (Sony PlayStation 4, 2017). Condition is Like New. Shipped with USPS First Class Package. Assassin's Creed Liberation HD: The year is 1765. You will not only witness history. You will make it. Assassin's Creed: Origins (Microsoft Xbox One, 2017). Condition is Good. Shipped with USPS First Class Package. Assassin's Creed: Origins (Microsoft Xbox One, 2017). In great condition, like new. Trending at $18.79eBay determines this price through a machine learned model of the product's sale prices within the last 90 days. Assassin's Creed Odyssey Gold Edition - Xbox 1 -by Ubisoft. Forge your path in a world on the brink of tearing itself apart. Influence how history unfolds in an ever-changing world shaped by your choices. Assassin's Creed Origins ps4 Standard Edition . Condition is Very Good. Any codes inside the box have already been redeemed. Shipped with USPS First Class Package. Assassin's Creed: Origins (Microsoft Xbox One, 2017). Condition is Very Good. Shipped with USPS First Class Package. Assassin’s Creed: Origin for PS4. Disc and case are in mint condition. New ListingAssassin's Creed: Odyssey---PS4---(Used) Free Shipping Adult owned. Assassin's Creed: Odyssey---PS4---(Used) Free Shipping Adult owned.. Condition is Very Good. Shipped with USPS First Class Package. Assassin's Creed: Odyssey - Standard Edition (Microsoft Xbox One, 2018) - USED. Condition is Like New. Shipped with USPS First Class Package. Assassin's Creed Odyssey Standard Edition Xbox One 2018. Condition is Very Good. Shipped with USPS First Class Package. Assassin's Creed: Origins (Microsoft Xbox One, 2017). Condition is Like New. Shipped with USPS First Class Package. Trending at $3.70eBay determines this price through a machine learned model of the product's sale prices within the last 90 days. Model: UBP30512175. Make: Ubisoft. Forge your destiny in a world on the brink of tearing itself apart. Influence how history unfolds in an ever-changing world shaped by your choices. Forge your path in a world on the brink of tearing itself apart. New ListingAssassin’s Creed Odyssey Spartan Collector Edition (PS4) - NO GAME OR CODES!!! Assassin’s Creed Odyssey Spartan Collector Edition (PS4) - NO GAME OR CODES!!!. This auction is for all components of the Spartan Edition minus the game/steelbook and any relevant codes. All other items are NIB. Any questions please message. Thank you. Assassin's Creed Origins: Over 50 E3 awards and nominations. 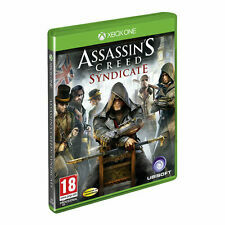 Reveal the origin story through a tale of the first Assassin on a fearless quest for redemption. 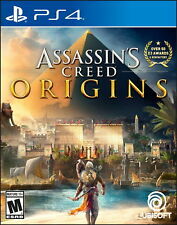 5 out of 5 stars - Assassins Creed Origins (Playstation 4) Brand NEW !! 202 product ratings202 product ratings - Assassins Creed Origins (Playstation 4) Brand NEW !! The disc or discs have been buffed as needed. Item is in good shape with some slight wear or damage present. Case may have minor damage, such as a crack. The game manual is included and in good condition with some wear evident. All items packed in bubble mailers and do not include an invoice or receipt in package. All photographs are stock photographs and may differ slightly from actual items sold. We are Goodwill North Central Wisconsin. Ships from our location within 1-2 business days (business days Monday - Friday) from USA. All items guaranteed. Assassin's Creed: Origins Preorder Edition(Microsoft Xbox One, 2017). Condition is Like New. Shipped with USPS First Class Package. Game package is open, although in pristine condition. Disc itself has no scratches. 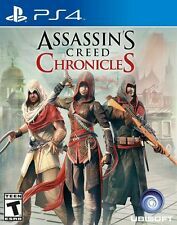 Assassin's Creed Chronicles (Sony PlayStation 4, 2016). Condition is Very Good. Shipped with USPS First Class Package. I will make every effort to make things right. Functional Condition: Used but still works! Assassin's Creed: Origins for Xbox One in excellent condition. Only played a few times. Please message me with any questions. Assassin's Creed Odyssey Standard Edition Xbox One 2018. Condition is Brand New. Shipped with USPS First Class Package with delivery confirmation. 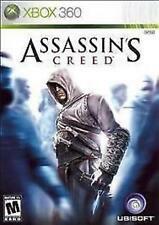 Assassin's Creed 1 Collector's Edition Tin/Box w/Insert ARTWORK & FIGURINE ONLY!